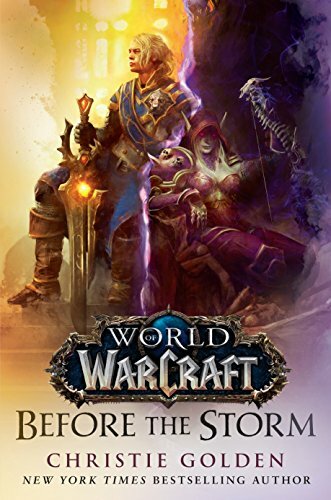 Nice, easy read but don’t bother if you aren’t a huge World of Warcraft fan. The theme of opposites coming together with horrible or explosive results jumped out at me. The King devoted to the light is paired up with the Queen who yearns for shadows and quietude. When their forces meet in an attempt to find common ground it ends up with a seemingly inevitable conflict and the deaths of many involved. An estranged husband and wife from opposing factions are brought back together. After a rough reconciliation they literally end up on top of a bomb. Life and Death are brought together in the form of the forsaken. People who have died but were brought back to some kind of life in decaying bodies. They are most cut off from their former lives and families and struggle to find a new way to exist. Since this is a book that is part of a larger universe, the chances that anything significant will happen to the characters was minimal. We know who survives the conflict and who doesn’t. I finished the book thinking I knew more about the characters and their thought processes than I had before. But that doesn’t mean I agree or even understand them. The Horde side warchief still remains an enigma to me. She seems like a study in opposites within herself. Ultimately, I was left with little understanding of what her goals or motivations are. She describes her own sense of honor as ‘somewhat fluid’. On the other side, the Alliance king seemed almost too simple in his motivation to find peace and have everyone reconcile. While he seems to be taking the his role seriously and willing to fight for it, he also seems blind to some of the realities of his world. In the end, some blanks have been filled in as I start playing the Battle for Azeroth expansion that launched this month. There are still so many blanks and questions left that, while I’m glad I read the book, I may be slightly more confused about some of the story than when I started out.